Little Rock (LR) men’s basketball pulled off an upset for the ages this past Saturday. 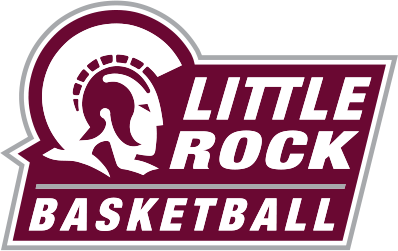 On March 3, LR won in overtime against the Louisiana Ragin’ Cajuns, the second-ranked team in the mid-majors and first in the Sun Belt Conference. The victory was exactly what the team needed entering the Sun Belt Tournament. A couple of hours before the team was to leave for the Sun Belt Conference Tournament, Coach Flanigan, Jaizec Lottie, and Ben Marcus allowed The Forum to interview them for the “10 Questions” series. We appreciate their honesty and humility. Question: How big was the win Saturday? Question: Coming in as the #12 seed, nobody is expecting too much from you. Can you see yourselves winning the tournament? Question: When I say the word dedication, what is the first thing that comes to mind? Forum: What’s the 100 DUB? (Lottie shifts the question to Ben). Marcus: “First part one hundred stands for a 100% effort, which is what each and every teammate, player, coach, or anybody involved with our program, that’s what we’re about. D is for discipline, that’s what you have to have for 40 minutes; as long as we have that we can do what we need to do. U is for the unselfishness part, that’s what helps our chemistry out, not one selfish person on this team. The B is for body language. Just having good body language trickles down to everybody. If we see coach happy, we’re happy. If we see coach fired up, we’re fired up. It all just spreads around us when we have good body language. Question: What game or games did you see the most fight in this team? Coach: “I would say it started out with our first win in conference play against Monroe here at home. Probably our best game was this past weekend where everybody was clicking. Different times during the course of the year, one or two guys have played better (than others). For the first time I thought, this Saturday, everybody played well. Question: Realistically speaking, what are the expectations entering the Sun Belt Tourney? Question: What team do you all want to see in the tournament? Question: When it comes to the game’s minute by minute, half by half grind, how do you all win? Question: Who is the team jokester? Question: Who is the team nucleus? Question: How did the removal of Andre Jones effect the team? Question: Of course, you all want to go down there and win, but if you don’t win the tournament, what would you call a successful tournament?